Looking for a vegan cosmetics company? Check out 100% Pure, a relatively new company that makes vegan cosmetics, skin care, and hair products. And of course, there is no animal testing. We tried their 100% Pure Pigmented Mascara, which conditions and tints your lashes with real berry pigments and black tea. This mascara gives a really natural finish with absolutely no clumps at all. 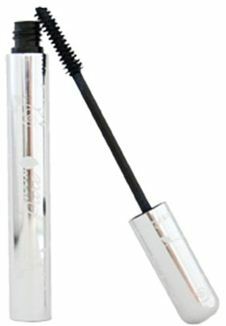 Its strength isn’t really with thickening your lashes, but you get decent lengthening. Here’s what’s interesting: you may not have realized how irritating your mascara is on your eyes until you try this product. It’s great for sensitive eyes and washes away easily with soap and water. In sum, 100% Pure Pigmented Mascara is perfect for everyday, but you’ll want more if you like drama. But after trying such an excellent product that is without chemicals, animal products, or animal testing, we wonder why all cosmetics companies don’t follow suit. Hopefully products like 100% Pure’s will become the norm instead of the exception. The best thing you can do for sensitive skin is keep its barrier intact. Unfortunately, sometimes this gets damaged with all of the chemical and manual exfoliators on the market. So even if you don’t have sensitive skin naturally, you may have inflamed skin if you’re using harsh cleansers or moisturizers with acids too often. We tried Burt’s Bees Sensitive Skin Facial Cleanser and were very pleased with the results. In only one week we saw a transformation in our skin – less redness and irritation, and a lot less dryness. Since this is a very gentle cleanser, you may want to take off your makeup first with makeup removing towelettes such as Neutrogena’s. We must warn that at first this product may feel like your skin has a film on it, and that may be because you’re accustomed to your skin being stripped of its natural moisture. Try it out for at least a week to see results. We recommend this for not only people with sensitive skin, but for those who have used harsh products and want to give their skin a break. If you have acne, we recommend alternating using this cleanser and your regular acne cleanser until you get the right balance. For instance, try using Sensitive Skin Facial Cleanser in the morning and your acne wash at night. 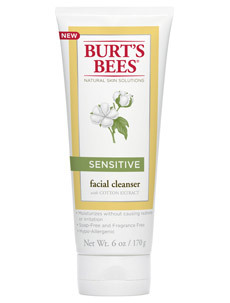 Burt’s Bees Sensitive Facial Cleanser is not only 99% natural, it is also fragrance free and hypo-allergenic.